Want to learn more about business majors at the University of Oregon? Take a tour and get answers about what it’s like to be a student at the Lundquist College of Business. Duck Guide tours and information sessions are provided by current business undergraduate students. The Duck Guides program provides prospective undergraduate students and their families with an information session and tour that lasts approximately one hour. The sessions start inside the Lillis Business Complex in room 145. Information sessions and tours are held during the fall, winter, and spring academic terms—except for finals week and school breaks. Spring term 2019 information sessions and tours start on Monday, April 1, and continue through Friday, June 7. Sessions are held on Mondays at 12:45 p.m. or 3:45 p.m.; Thursdays at 3:45 p.m.; and Fridays at 12:45 p.m. or 3:45 p.m. After entering your information, you will be presented with a calendar to pick your tour time. If the date and time are not available on the calendar, it means the tour is full. There are no tours during finals week or spring break (March 16, 2019 through March 31, 2019). Tours in spring term begin on Monday, April 1 and end Friday, June 7. There are no tours on Monday, May 27 as the university is closed due to the Memorial Day. Tours resume in Fall term on Thursday, October 3. If you still have questions about our majors after reading our website, call 541-346-3303. Transfer students are welcome to attend an information session and tour. For specific transfer articulation questions, we encourage you to meet with an academic advisor. An appointment can typically be made with enough advance notice by calling 541-346-3303. Whenever you visit us, we also hope you will also enjoy a full campus tour, which includes a walk through the Lundquist College of Business. Already admitted to UO for Fall 2019? Consider attending Duck Days, the University of Oregon’s special program for admitted students and their families. If you attend Duck Days, you will receive information similar to what you would on a Duck Guide tour, so there is no need to sign up for both. Use the form below to sign up for Duck Guide tour. After inputting your information, you will be able to choose from available tour times. If the date and time are not available on the calendar, it means the tour is full. Questions? 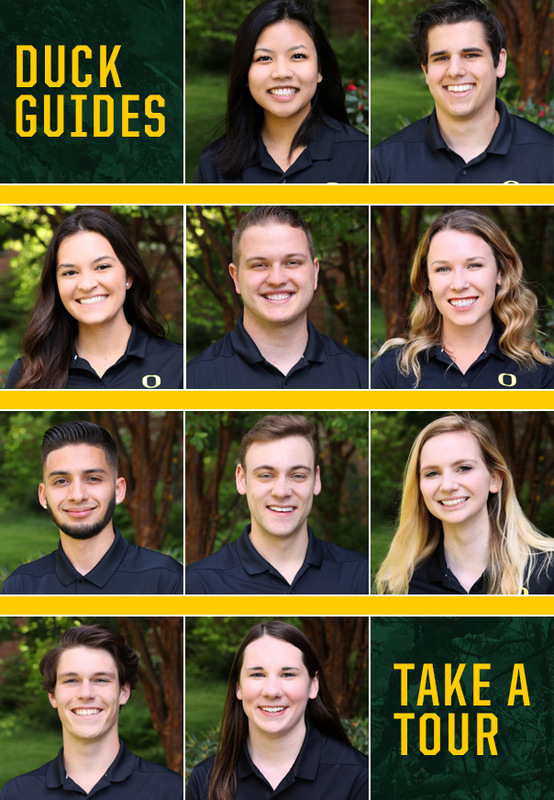 Call 541-346-3303 or email duckguides@uoregon.edu.